What a great twist on the style. She's so believable. very good, I actually thought for a moment it was a photograph. The colors are great, amazing atmosphere!! This looks amazing!! I really like her facial expression!! yeah, really good job here on this one. Excellent work. Wow. Talk about phenomenal. This is striking in its bold realism and execution. I'd like to do this ... Would you teach me ? .. 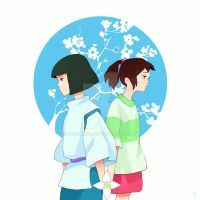 Excellent, I love the colors and texture, you have Chihiro a lovely, more realistic look ! The eyes and lips are what you painted best ! I love your sense of colouring! This is beautiful! Oh i'm so glad you like it thanks. oh my goodness this is so pretty!